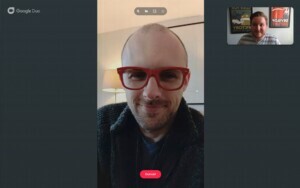 Update, February 26, 2019 (12:15 PM ET): Almost a month after word leaked that Google Duo would come to the web, the feature is now live. Just visit the Google Duo website and, assuming you’re logged into your Google account, you should see the new Google Duo web interface. It appears most if not all the major features of the app version of Google Duo are here, including “Knock Knock” support. With the addition of this browser version of Google Duo, the video chat service has a stronger chance of converting users from other video chat services like Facebook Messenger and WhatsApp. Orignal Article, January 25, 2019 (04:19 PM ET): So far, using Google Duo has been limited to smartphones, tablets, and the majority of Chromebooks. In the near future though, the Google Duo video chat service could work on your laptop or desktop computer through your internet browser. This new rumor comes from an anonymous source speaking with 9to5Google. According to the source, the web version of Duo will work in the Google Chrome browser (naturally) as well as other competing browsers like Mozilla Firefox and Apple Safari. Since the service will be browser-based, we can assume there will be browser notifications for incoming calls and other alerts. However, it’s unclear how fully-functional the web version of Duo will be. For example, we don’t know if it will support the “knock knock” feature or the popular video messaging feature. The anonymous source claims that we should see Google Duo for the web at some point in the coming weeks. Google recently brought Messages (formerly known as Android Messages) to the web, which is one of its other consumer-focused messaging services. With Google Duo and Messages both available via a browser, it should encourage user adoption. That’s good news for Google, as other messaging services — especially those owned by Facebook, which are joining forces — are way ahead of the game. What do you think? Will you use Google Duo on the web if and when it arrives? Let us know in the comments!